Summary: A new neuroimaging study finds iron is distributed in an unusual way in the brains of people with Parkinson’s disease. A special type of brain mapping reveals pathological alterations that conventional neuroimaging is unable to track. Iron occurs naturally in the human body. However, in people with Parkinson’s disease it distributes in an unusual way over the brain. This is the result of a study by the DZNE that has been published in the journal Brain. 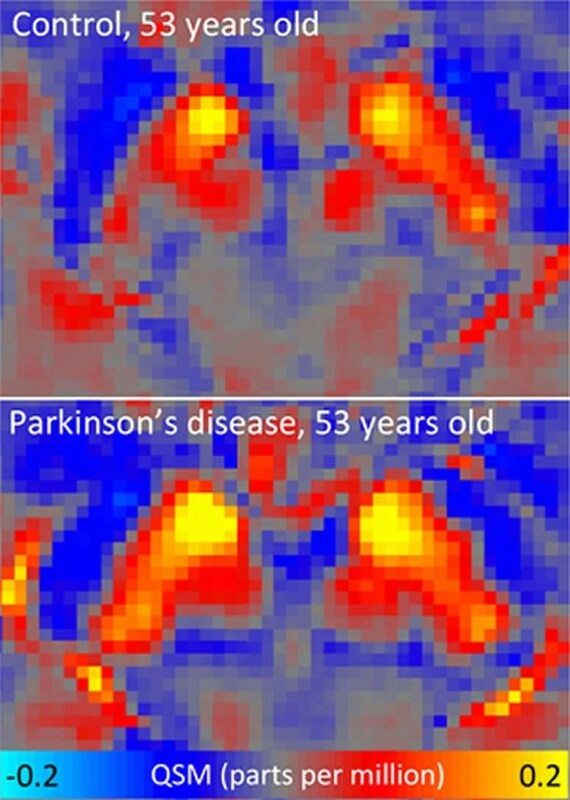 Researchers headed by Professor Peter Nestor applied a special type of magnetic resonance imaging (MRI) allowing them to map iron levels in the entire brain — it is the first time this is done in Parkinson’s disease. This approach could improve the diagnosis of Parkinson’s and shine new light on the involved disease mechanisms. DZNE researchers have found altered iron levels in the brains of people with Parkinson’s. With excess iron in some areas and decreased iron content in others. For example, iron concentration in the “substantia nigra” – a brain area involved in movement control – was unusually high. This is exemplified by these two brain scans: They show the substantia nigra in a healthy control and a patient. High QSM signal (red and yellow) indicates high iron content. NeuroscienceNews.com image is credited to DZNE/Julio Acosta-Cabronero. Iron is indispensable for the human metabolism. It manifests e. g. in red blood cells, enzymes and particular proteins that serve as an iron deposit. However, iron is also potentially harmful as it is able to trigger production of reactive molecular species that may cause “oxidative stress” and ultimately damage to neurons. For the current study, the DZNE researchers teamed up with colleagues from the University Magdeburg’s neurology department. Together, they examined the brains of 25 persons with Parkinson’s and 50 healthy subjects by using a special MRI technique called QSM, which is the acronym for “quantitative susceptibility mapping”. QSM is a quite recent development. As with conventional MRI, it is non-invasive and relies on a combination of magnetic fields, electromagnetic waves and analysis software to generate pictures of the insides of the human body. However, QSM benefits from raw data usually discarded in conventional MRI. As a consequence, QSM can probe a magnetic parameter indicating metallic presence. “QSM shows how magnetic susceptibility varies across the brain. In our study, this is mainly caused by local variations in iron concentration. The bottom line is that we are mapping the spatial distribution of iron in the brain,” Acosta-Cabronero explains. “MRI in neurodegenerative diseases has mostly focused on measuring the degeneration itself, meanwhile we know extremely little about its causes. We hope that by probing with new approaches such as whole-brain QSM, we may be able to get clues to the mechanisms of disease,” Peter Nestor says. By matching the brain scans of patients and healthy controls, the researchers were able to identify pathological changes. “In Parkinson’s patients we found excess iron, as expected from previous studies, in the substantia nigra but also in extensive areas of the neocortex,” Nestor says. In contrast, standard MRI showed no significant differences between people affected by Parkinson’s and healthy study participants. In addition, QSM revealed anomalies also in areas that until now have attracted little interest in Parkinson’s. “There is a region in the lower brain called dentate nucleus, which is normally iron rich. Yet, our whole-brain approach indicated decreased iron content in this area in Parkinson’s patients – extremely so in some individuals – highlighting how this method can open new avenues of investigation in Parkinson’s disease,” Nestor says. Image Source: NeuroscienceNews.com image is credited to DZNE/Julio Acosta-Cabronero. DZNE “People With Parkinson’s Show Altered Iron Levels in Their Brains.” NeuroscienceNews. NeuroscienceNews, 28 November 2016. DZNE “People With Parkinson’s Show Altered Iron Levels in Their Brains.” http://neurosciencenews.com/parkinsons-iron-levels-neurology-5609/ (accessed November 28, 2016). Although iron-mediated oxidative stress has been proposed as a potential pathomechanism in Parkinson’s disease, the global distribution of iron accumulation in Parkinson’s disease has not yet been elucidated. This study used a new magnetic resonance imaging contrast, quantitative susceptibility mapping, and state-of-the-art methods to map for the first time the whole-brain landscape of magnetostatic alterations as a surrogate for iron level changes in n = 25 patients with idiopathic Parkinson’s disease versus n = 50 matched controls. In addition to whole-brain analysis, a regional study including sub-segmentation of the substantia nigra into dorsal and ventral regions and qualitative assessment of susceptibility maps in single subjects were also performed. The most remarkable basal ganglia effect was an apparent magnetic susceptibility increase—consistent with iron deposition—in the dorsal substantia nigra, though an effect was also observed in ventral regions. Increased bulk susceptibility, additionally, was detected in rostral pontine areas and in a cortical pattern tightly concordant with known Parkinson’s disease distributions of α-synuclein pathology. In contrast, the normally iron-rich cerebellar dentate nucleus returned a susceptibility reduction suggesting decreased iron content. These results are in agreement with previous post-mortem studies in which iron content was evaluated in specific regions of interest; however, extensive neocortical and cerebellar changes constitute a far more complex pattern of iron dysregulation than was anticipated. Such findings also stand in stark contrast to the lack of statistically significant group change using conventional magnetic resonance imaging methods namely voxel-based morphometry, cortical thickness analysis, subcortical volumetry and tract-based diffusion tensor analysis; confirming the potential of whole-brain quantitative susceptibility mapping as an in vivo biomarker in Parkinson’s disease.